Frame ends protruding from the sand. Description: The John F. Warner spent several years trading between the Great Lakes and European ports like Greenwich and Liverpool, England and Glasgow, Scotland, carrying lumber and staves overseas and pig iron on the return trips. After 1860, it stayed closer to home, engaged in the booming lumber trade. The schooner met its end at Alpena, Michigan. Anchored off the river mouth, the anchor chain was parted by heavy seas and the ship was driven ashore near the lighthouse. Continuous buffeting by the waves soon broke the vessel in half. 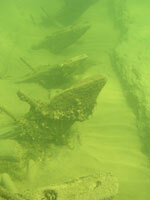 The cargo was removed a few days later, and the wreck was abandoned south of the harbor where it lies today. 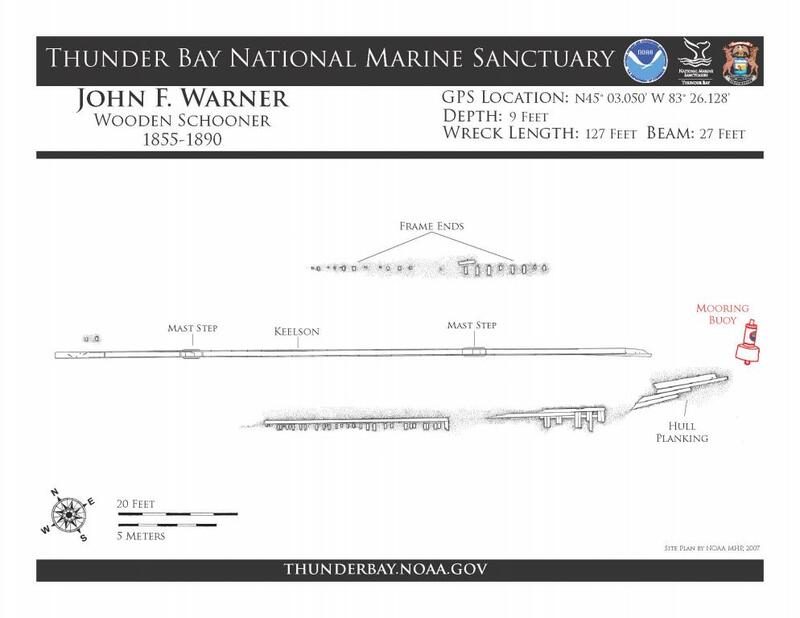 John F. Warner site plan.